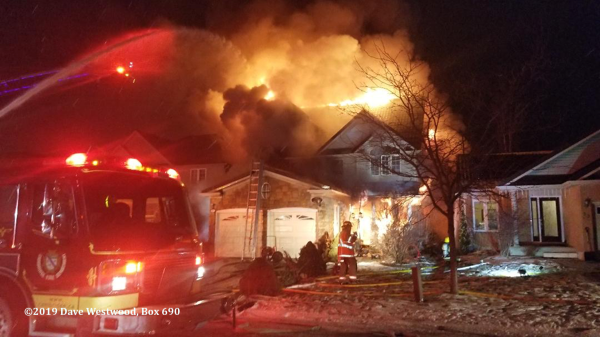 Cambridge, Ontario P2, P1, A6, R1, and Car 6 were dispatched to 51 Livingstone Crescent for a dryer fire January 17, at 20:30. The closest station to the call was Station 3 but A3 was on a medical call. P2 arrived and reported some smoke showing and all occupants were out of the building. P2 pulled a line into the basement reporting heavy smoke, and near zero visibility. A hydrant was picked up as firefighters performed primary searches of the first, second, and third floors while fire attack looked for the source of the fire in the basement. 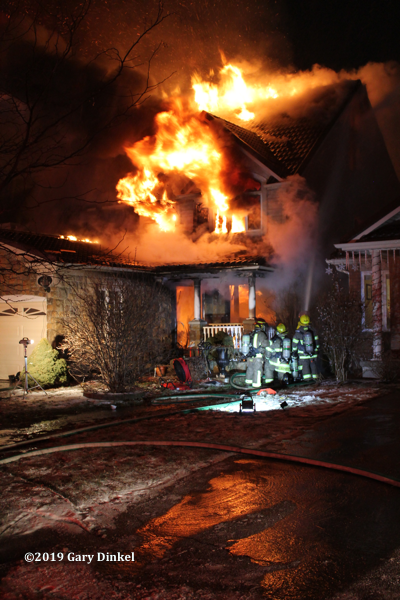 The fire was located at the rear corner of the basement and quickly knocked down. Basement windows were taken out so ventilation could be performed by the attack crew. A3 cleared from their call and command had them return to their station as the fire was knocked down. Three firefighters were sent to perform a secondary search of the house and while on the second floor they reported the lights had gone out. Within a couple of minutes heavy black smoke was showing from the first and second floor. A minute later both floors flashed over. Two firefighters were able to exit via the stairs while a third had to bail out a second floor window onto the garage roof. He was transported to hospital with second degree burns and wass released the next morning. His gear and SCBA saved his life. The entire building was now fully involved, and fire came through the steel roof within minutes. A6 was setup quickly to protect exposures, and A3 was added to the call, ordered to grab another hydrant, and get their aerial up. 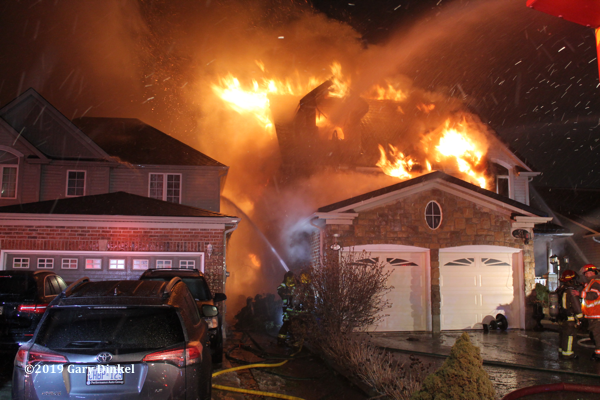 Large lines were pulled to attack the fire and protect exposures. A third hydrant was pulled from Newport Drive as A6 didn’t have enough water to supply their bucket and lines. A4 and P5 were added to the call necessitating call-in of off-duty crews to staff spare apparatus now that all six stations were on scene. 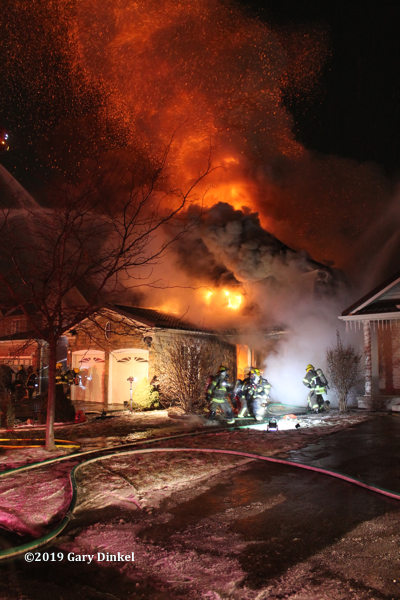 The upper two floors collapsed 30 minutes after the flashover and the fire was brought under control in two hours. One station remained on scene all night, and others are still on scene chasing hot spots. Due to the collapse, firefighters can’t go into the structure to work on fully extinguishing the fire. The Ontario Fire Marshall is on the scene to investigate the cause. Damage is pegged at more than $750,000. Box 690 provided rehab. My photos and video were shot 25 minutes after the flashover. Box 690 member Dave Westwood’s photos taken immediately after the flashover.